"My Dad and I back in “The Good Ole Days”! Notice the Sure-Shot Yentzen Classic Duck Caller hanging from around his neck." "My son, Ryan at nine hunting the potholes in eastern Washington. His first duck – a drake wigeon using my Sure-Shot and Yentzen duck calls I bought back in 1968! Always and still using them and have passed one down to Ryan!" "The man of many bands himself, my dad Neal Trahan. Black call and whistle on his lanyard are Sure-Shot, only duck calls he’s brought to the blind for the better part of 40 years." A Two-Title Family in duck calling! "This is Daddy and me in Stuttgart, AR in 1963. He used a double-reed Yentzen Classic and he and Cowboy were friends." "I've had the same call around my neck since 1978. 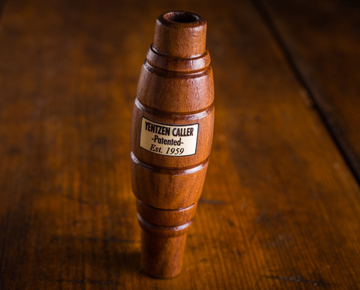 I have over thirty Sure-Shot Yentzen calls – but I always return to my original one. "My dad won several duck calling contest in the golden triangle area and was the reason I took up duck calling. My dad and Cowboy worked with me to win five world championships and two international championships using a Yentzen duck call." "My fondest memories are sharing early morning duck hunts with my children alongside a South Dakota prairie pothole and Sure-Shot has been with me on every hunt for the last 37 years. "Father son Osceola turkey hunt. Makes being a dad all worth it. Check out Sure-Shot turkey box call my son Luke called the gobbler in on. "My father gave me my first Sure-Shot duck call thirty plus years ago. Still blow one every day hunting. Passing the tradition on now." "I still have my dad's first Sure-Shot duck call." "My son and his Grandpa. The man who introduced me to Sure-Shot Game Calls"
"Thank you Sure-Shot Game Calls for letting me share my story and picture and for making such a great call. Mine is getting some wear and tear but it still does the trick and I'm 49 years old now." "My son using my husbands Sure-Shot Yentzen duck call that he has had since high school." "This photo was taken in 1984 on a cold Colorado morning goose hunt. My dad who is now 86 years young gave me the passion and desire to hunt. My dad has a Sure-Shot goose call around his neck. I still own it today and a duck call as well." "My dads call from way back. Still one of my favorite calls. " "My pop at 77 years old chasing Canadas with me in Oklahoma. He taught me how to call on a Sure-Shot Yentzen 30 years ago." "I still have my double reed and triple reed I used when guiding for eight years at Prairie Wings south of Stuttgart and hunted in the lower Ouachita River bottoms and Overflow swamp in south Arkansas back in the 60's and early 70's."